The Outta Space Crew is a funk band covering genres like Old School Funk, Breakbeat Classics, P-Funk, Electro Boogie, Soul and HipHop. By playing the traditional horns plus rhythm section of early RnB and soul music but also using synths, electronic drums and samples that shaped the sound of the 70s, 80s and 90s, OSC developed musical time traveling as their trademark. The band mixes and blends different styles and tunes live just like a DJ set. 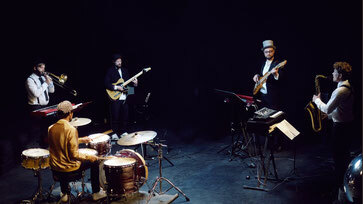 Originally formed as a live act for breakdance battles the 5 musicians also produce their own tunes. In 2018 the EP Hip Tramp with 3 originals as a remix by producer team First Touch was released on vinyl. OSC also throw their own party by organizing the regular jam Funk Injection featuring breakdancers, MCs, DJs and singers.